A photo showing the debate released by the Dutch Embassy in London. The Dutch Embassy in London hosted an election campaign for the elections on Wednesday, Jan. 16, while banning Turkish officials' referendum campaign meetings back home. 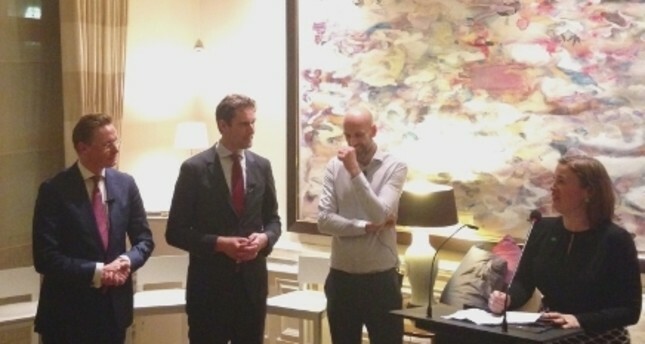 According to a report published on the official website of the Embassy of the Kingdom of the Netherlands in London, the panel was attended by three major political parties in the Netherlands, VVD, PvdA and D66, where they discussed some crucial political subjects, such as Brexit, nationality and potential coalitions within the government. Meanwhile, on Saturday Dutch authorities responded to a similar event at the Turkish Consulate in Rotterdam in a much harsher way. The Rotterdam police detained Turkish Family and Social Policies Minister Fatma Betül Sayan Kaya and deported her to Germany after a five-hour stand off in front of the consulate building. However, several reports showed that the Turkish people campaigning for a "no" victory in Turkey's April 16 referendum for a constitutional change, did not face any obstacles during their campaign activities in the Netherlands. Former Minister Abdullatif Şener and Union of Turkish Bar Associations (UTBA) President Metin Feyzioğlu were among those who campaigned against the constitutional changes. Earlier on Saturday, the Dutch government canceled the Turkish foreign minister's flight clearance and blocked the family minister's convoy from entering the Turkish consulate in Rotterdam. The ministers were due to meet the Turkish population in the country ahead of the April 16 referendum. The Turkish Foreign Ministry asked the off-duty Dutch ambassador in Ankara, who was on leave, not to come back "for a while." Upon her arrival in Istanbul, Minister Kaya held a press conference at Istanbul's Atatürk International Airport where she said the way Dutch authorities and police handled the situation was unacceptable.